Photograph all 9 Constellations in Kingdom Hearts 3 to earn the Stargazer achievement and new blueprints for your Gummi Ship. In Kingdom Hearts 3, players have been wondering where to find and photograph all 9 Constellations. 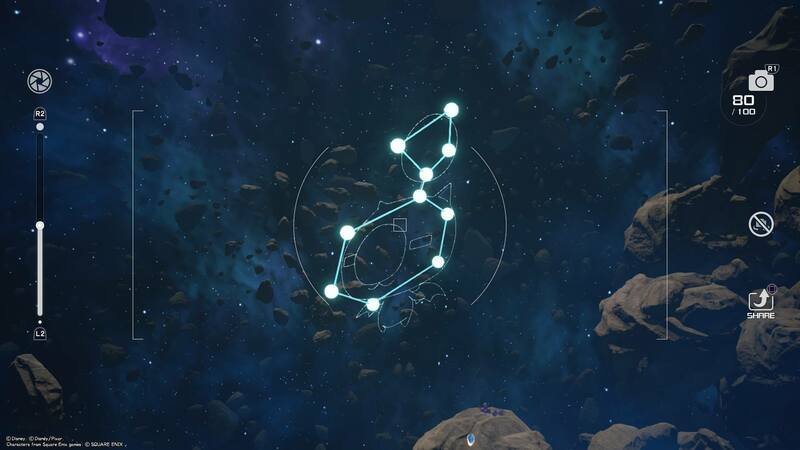 Rather than explore each world for collectibles like Lucky Emblems, players will need to fly their Gummi Ship around in search of unique star clusters. By photographing these clusters, you’ll be able to view their full shape and add them to your collection. As a reward for photographing all 9 Constellations, you’ll earn the Stargazer achievement and unlock new blueprints for your Gummi Ship in Kingdom Hearts 3. Having a hard time finding one or more Constellations in Kingdom Hearts 3? We’ve got you covered! Below, we’ve put together a complete guide on where to find and photograph all 9 Constellations in Kingdom Hearts 3. 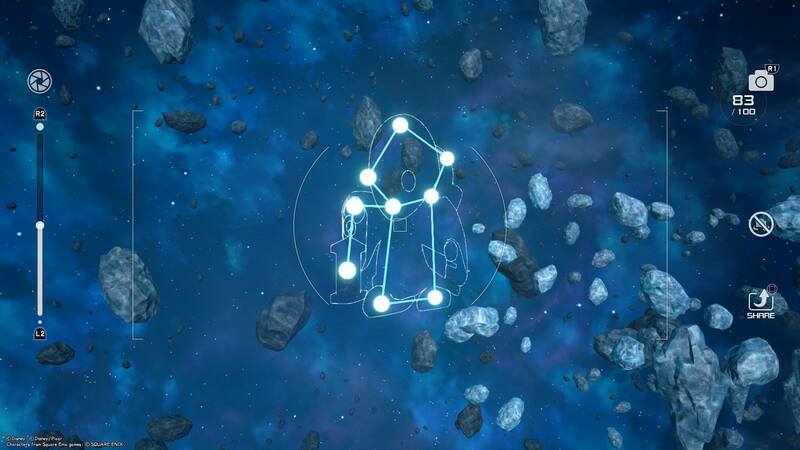 The Bomb Constellation is located near the Olympus world in the Starlight Way galaxy of Kingdom Hearts 3. The Constellation in the shape of a Bomb can be found near the Olympus world in Starlight Way. Choose to embark from Olympus, and before you begin flying, turn your camera around and to the right of the Olympus world, you’ll be able to spot a cluster of green stars. 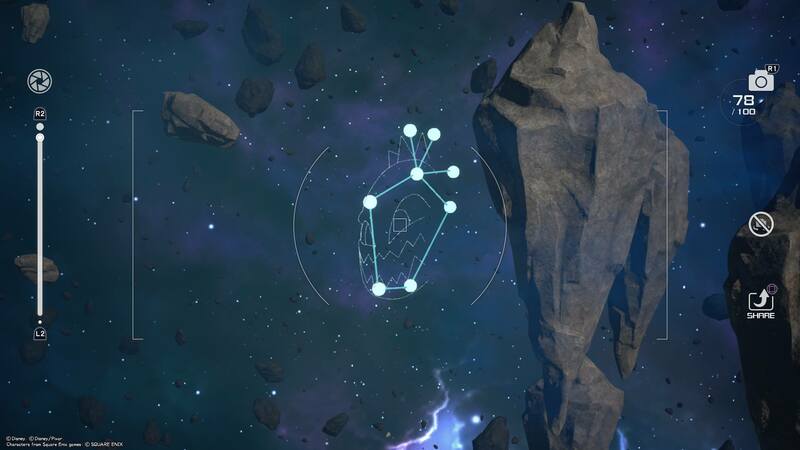 Fly towards this cluster and pull out your camera by opening your Menu on Xbox One or Options on PlayStation 4. Line everything up and snap a photo to add the first Constellation to your collection in Kingdom Hearts 3. 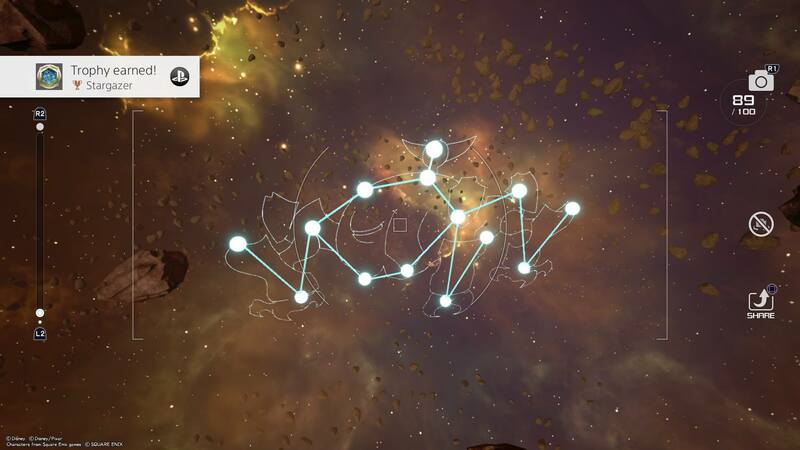 The Moogle Constellation is located near the Toy Box world in the Starlight Way galaxy of Kingdom Hearts 3. The Constellation in the shape of a Moogle can be found near the Toy Box world in Starlight Way. Choose to embark from Toy Box, then head right through the galaxy. Near a cluster of small asteroids you’ll spot one of the green stars that indicate a Constellation. Fly towards this star to reveal the Constellation, then pull out your camera, line everything up, and snap a photo to add the second Constellation to your collection in Kingdom Hearts 3. The Cactuar Constellation is located near the Kingdom of Corona world in the Starlight Way galaxy of Kingdom Hearts 3. The Constellation in the shape of a Cactuar can be found near the Kingdom of Corona world in Starlight Way. Choose to embark from Kingdom of Corona, and before you begin flying, turn your camera around to face behind you. On the right, you’ll see a bright green area near an asteroid field. Fly towards this and you’ll eventually stumble across the next Constellation cluster. Approach the Constellation, then pull out your camera, line everything up, and snap a photo to add the third Constellation to your collection in Kingdom Hearts 3. The Imp Constellation is located near Waypoint MST-01 in the Misty Stream galaxy of Kingdom Hearts 3. The Constellation in the shape of an Imp can be found near Waypoint MST-01 in the Misty Stream galaxy of Kingdom Hearts 3. Choose to embark from Waypoint MST-01, then head right through between a dark rock and a spiked white rock. After navigating through this area, look to your left and you’ll see a cluster of green stars. Approach these stars to reveal the Constellation then pull out your camera, line everything up, and snap a photo to add the fourth Constellation to your collection in Kingdom Hearts 3. The Tonberry Constellation is located near the Imp Constellation in the Misty Stream galaxy of Kingdom Hearts 3. The Constellation in the shape of a Tonberry can be found in the same area where you photographed the previous Imp constellation in Starlight Way. After collecting the Imp, make a right and climb up a bit higher up into the sky. Near two large rocks, you should be able to spot a few green stars. Fly towards these stars to reveal the Constellation, then pull out your camera, line everything up, and snap a photo to add the fifth Constellation to your collection in Kingdom Hearts 3. 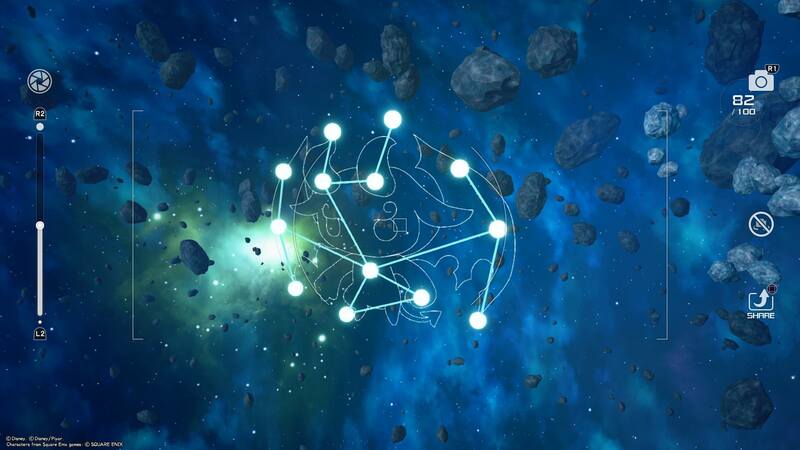 The Endymion Constellation is located near the Caribbean world in the Misty Stream galaxy of Kingdom Hearts 3. The Constellation in the shape of an Endymion can be found near the Caribbean world in Misty Stream. Choose to embark the Caribbean, then make a right and follow the boundary until you spot several green stars. Fly towards these stars to fully reveal the Constellation, then pull out your camera, line everything up, and snap a photo to add the sixth Constellation to your collection in Kingdom Hearts 3. The Ultros Constellation is located near the Keyblade Graveyard world in the Eclipse galaxy of Kingdom Hearts 3. The Constellation in the shape of an Ultros can be found near the Keyblade Graveyard world in the Eclipse galaxy. Choose to embark from The Keyblade Graveyard, then before you begin flying look directly up above you. There, you’ll see the cluster of stars comprising the next Constellation. Fly towards and above the ship then turn around, line everything up, and snap a photo to add the seventh Constellation to your collection in Kingdom Hearts 3. 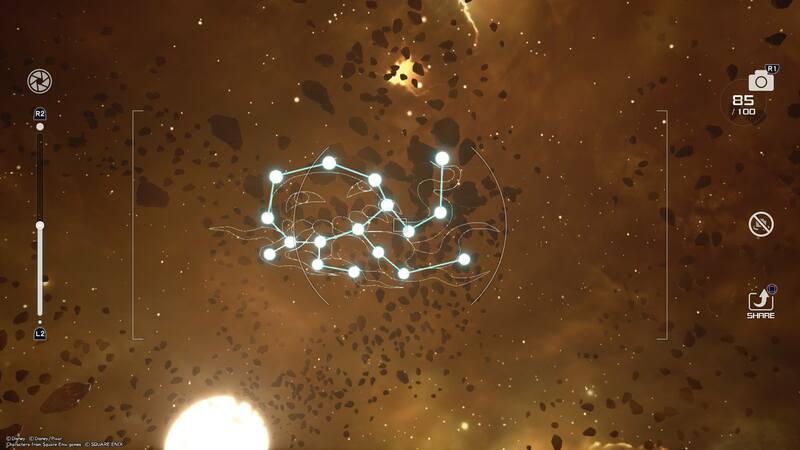 The Bismarck Constellation can be found by placing a marker on Waypoint ECL-01 and flying towards it while above the large ship in the Eclipse galaxy of Kingdom Hearts 3. 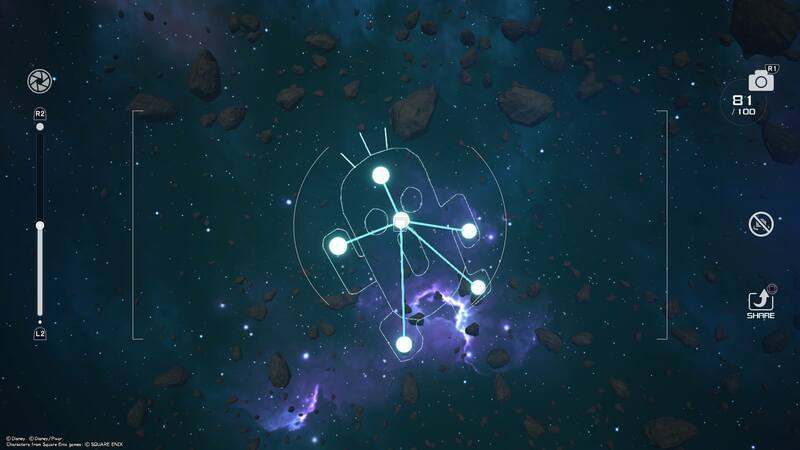 The Constellation in the shape of a Bismark can be found by placing a maker on Waypoint ECL-01 then flying over the ship towards the direction marker. Keep an eye on your right while flying towards this marker and you should be able to see a few green stars near several asteroids. Fly towards these stars until all of them are in view. After that simply line everything up and snap a photo to add the eighth Constellation to your collection in Kingdom Hearts 3. 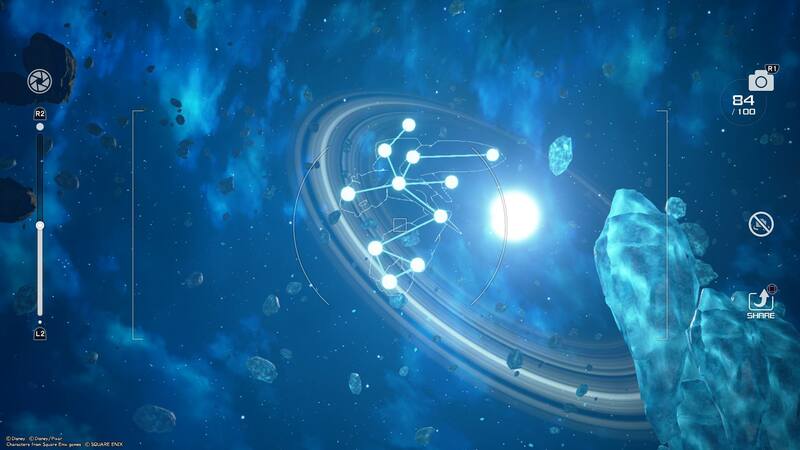 The Omega Constellation is located near the Bismarck cluster near the outer border of the Eclipse galaxy in Kingdom Hearts 3. 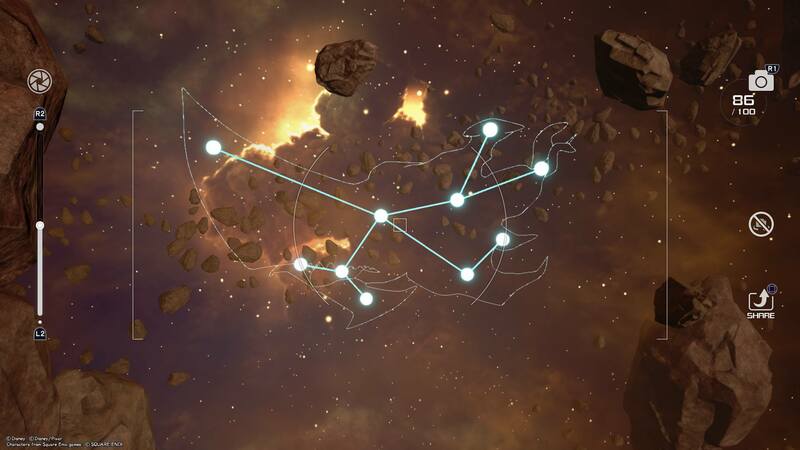 The Constellation in the shape of an Omega can be found near the Bismarck cluster, though it’s a bit tricky to find. We recommend flying towards the Bismarck, then heading left and skirting the map border until you see another cluster of green stars indicating the final Constellation (don’t go too far past your marker over Waypoint ECL-01). You may need to redirect the angle by flying away from the stars then back towards them. Once you’re able to line them up, snap a photo and add the ninth and final Constellation to your collection in Kingdom Hearts 3. Once you’ve photographed all 9 Constellations, you’ll unlock the Stargazer achievement in Kingdom Hearts 3. You’ll also earn several new blueprints for your Gummi Ship in the shape of the Constellations you photographed, which can be fun to build and experiment with. So, which Constellation was the hardest to find? Let us know down in the comments below! For more on Kingdom Hearts 3, be sure to check out some of our previous guides including where to get Wellspring Crystal in Kingdom Hearts 3, all Battlegate locations in Kingdom Hearts 3, and all Flantastic Seven locations in Kingdom Hearts 3.